Extron Electronics has launched the MLC 55 RS and MLC 55 RS VC. Dubbed economical and easy-to-use, these MediaLink controllers are used for common AV functions such as power, input selection, and volume in single display applications. They feature a sleek new look, with redesigned backlit buttons and magnetically-attached faceplates that hide the mounting screws and configuration ports, giving the controllers a refined, uncluttered appearance. Both models include unidirectional RS-232 and IR display control, as well as discrete ON and OFF display power controls. The MLC 55 RS VC model features a newly-designed, larger volume knob for smooth, precise volume control of Extron MPA Series and select XTRA Series amplifiers. Flexible mounting options allow the controllers to be installed virtually anywhere, including walls, lecterns, or tables. 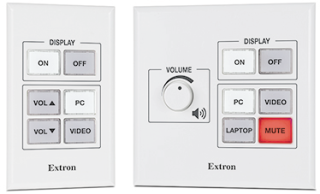 "Extron MediaLink button panel controllers have a proven record of simplicity and reliability in AV applications, worldwide," said Casey Hall, vice president of sales and marketing for Extron. "These new MLC 55 controllers offer stylish, full-featured configurable control for single-display presentation environments." Extron's easy-to-use MLC 55,62,64 Series configuration software provides fast and simple setup via USB when combined with one of many ready-to-use RS-232 or IR device drivers available on the Extron Web site. The configuration program and these two controllers also support IR Learning for creating new IR drivers from the handheld remote of a source or display device.